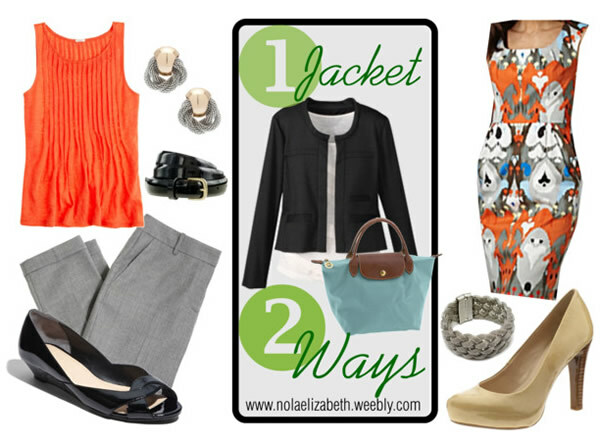 For more tips, also check out our newest article on how to dress for work over 40. I have wanted to write an article on how to dress for the workplace for quite some time now. So when I was approached by stylist Nola Johnson to do something for the site, I thought it would be a perfect topic for her. I’m sure I will still tackle this topic in the future as well, but for now here are her thoughts. The age-old misnomer is that work appropriate clothing and accessories should hurt your feet, constrict arm movements, and overall be uncomfortable. If you find yourself wiggling, smoothing, checking or straightening a handful of times before you even leave the house, change. When your clothes cause worry you can’t exude confidence and when you aren’t confident you don’t look as polished or professional as you could. What to look for when seeking comfort? If your office is anything like mine, then you experience a variety of temperatures throughout the day, from chilly conference rooms to downright balmy offices. Plan accordingly. This does not mean that you should keep your favorite college sweatshirt at your desk; rather, always try to have a neutral cardigan or jacket available. Here, we have a jewel neckline black jacket that can be paired with either the shell and capri pants or ikat print dress. In order to create a cohesive look it all begins with a focal point, or lead piece. Teams, much like outfits, become unsuccessful when they have too many people vying for a leadership role. Pick one piece of clothing or accessory to steal the show, think of it as your team leader. 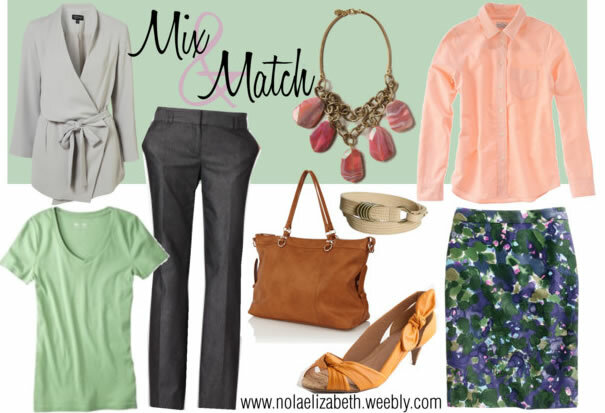 Can you find the focal point of these two looks? On the left, the statement necklace is going to be the focal point of this look. One might argue that the kitten heels could also be a focal point, but the v-neck of the t and jacket draw your attention to the necklace, while the long trousers will primarily cover the shoe. The floral pencil skirt is going to be the focal point of the look on the right because it is the dominant pattern of the look. Here, the shoes and necklace only serve to compliment the skirt by not overpowering it with a competing pattern or color, like red polka dots might do. Before you add a new piece to your wardrobe ask yourself, “What three other pieces does this match?” You don’t want to build individual outfits that have no relation to other looks in your closet. Instead, build a collection of pieces that are easily interchangeable with one another. On the first style board the accessories and shoes will go with either look, so what was once two looks has grown to four. On the second style board, not only will all the accessories go with either look but the tops are also interchangeable, bringing your total collection of looks within this post to eight. Now that’s a collection and you’re ready to head to work in style. Do you have a favorite tip or piece that you can’t wait to try? About the author: Nola Johnson creates style boards for customers and provides affordable styling options and a customized shopping experience. More information about Nola and her services can be found on her website. I appreciate all your kind words. Your comment on how often so a piece will be worn was exactly my point, so I’m glad that was your takeaway. You really want to purchase items that continue to garner compliments, no matter how frequently you wear them, because of the way you’re able to mix and match them. Thanks so much for enjoying the read! I haven’t worked at an office in almost 10 years (oh my gosh how did it go by that fast?) but I think these are great tips. Thanks for sharing. Yes my work attire is usually shorts and a singlet! It’s been more than 15 years since I worked full-time in an office! Not sure how I would cope in these heavily airconditioned offices here in Singapore…. Those are perfect match of clothes to wear in office, more elegant to wear and look more glamorous.I like the brown bag it fits to all my style to wear. I always have a cardigan or a jacket handy for the unpredictable air-conditioning which is set on cold, colder, freezing. I am going to ponder on creating a focal point and building a collection, both very useful tips. I hope that I can remember them when I am getting dressed. My memory is getting bad these days. Thanks so much! I would actually go with something right at or above the knee to give you more height. A dress with an A-line skirt would be really flattering. I would stay away from anything in a satin finish and look for prints or a solid matte material. Hope this helps! I work in an office in The Netherlands. Most of the time the temperature is the same though the day and through all departments. No extra jackets or cardigans necessary. Your tips are excellent Nola. I have been practising them for years. The one thing I still find difficult is the question: “what three other pieces does this match?” When I fall in love with something I will buy it anyway and see afterwards whether it matches with other clothes. Sometimes I am pleasantly surprised. But most of the times I just wear it the way I bought it. I do have a lot of clothes, I will admit. Your focus point tip is a good one and I would like to add that you also have to chose which of all your jewellery you are going to wear. If you have a necklace which stands out, than put some very simple earrings in, so the two don’t compete. Same with rings, bracelets and watch. Although there are women who get away with more is more. When you are the type… You can. Those are all good points! Sometimes it is hard to say no to something that you really like, so I completely understand. I love the first style board, excellent colour combinations! Thank you! Orange is a great color leading into spring and summer and the hints of light blue really go well with the “sherbert colors” trend. I love this idea less is more dressing. I really see that it takes less bottoms and more tops to make it work. i am trying this to lighten my load on my vacation. Previous post: Bobbi Brown lipsticks – 6 colours reviewed! What’s your favorite?